Taking laboratory studies into the ‘real world’ is every scientist’s nightmare. We love the lab – it’s where we feel safe, where we can control our world, our variables, our environment, and our interventions. However, lab studies can only tell us so much; eventually we need to know whether the findings from our lab studies apply in the real world. This is what the Tobacco and Alcohol Research Group (TARG) has endeavored to do. Findings in our lab suggest that individuals drink beer slower from a straight-sided glass compared to a curved glass. As a first step towards testing this effect in the real world, we carried out a small feasibility study to investigate whether a large-scale study might be possible. We needed to find out what outcome measure we could use to measure alcohol consumption, whether pubs and customers would be willing to take part, and what the logistical challenges of running a study of this nature might be. With this in mind, we contacted the owner of Dawkin’s Ales. He was open to the prospect of stocking three of his pubs (The Portcullis, Clifton Village; The Victoria, Clifton; and the Green Man, Kingsdown) with differently shaped pint glasses over a couple of weekends, using monetary takings as a proxy measure of the amount of alcohol consumed. He was extremely supportive of the endeavor and we would like to thank him for all his help. He seemed to be genuinely interested in the outcome of the study and in science in general. The feasibility study was a success: we showed that this type of drinking rate study can be carried out in a pub environment. However, there were some teething problems. Variables such as the size of a dishwasher caused unforeseen complications. Only when you get into the real world, do you realise how unstandardised it is. What we learned on our adventures in the real world is that communication is key. Cultivating good relationships with pub landlords and staff was vital to the success of the feasibility study. Naturalistic studies are unpredictable – nothing goes to plan. Good communication and rapport with stakeholders is vital and can assist in acquiring high quality data. Pub staff are also a great source of industry knowledge. We were educated on the extent of research by the drinks industry into the effect of different glass shapes on drinking behavior, which is extensive in their opinion. They were also full of ideas regarding what other experiments could be carried out. One of the landlords mentioned that people “drink with their eyes”, which piqued an interest in me about how our other senses may play a role in our drinking behaviour. Another comment was that people tend to drink more quickly when they are standing up. This hadn’t occurred to me before, but I was told that it has grabbed the attention of policy makers, who want to discourage ‘vertical drinking’ by demanding pub license holders supply more seating. Another topic that came up again and again is the use of “nucleated” beer glasses. 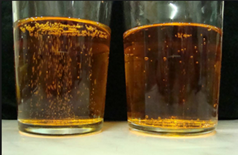 These have marking at the bottom of beer glasses to promote the formation of bubbles, maintaining the head for longer. 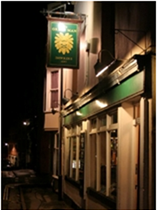 The importance attached to it by pub staff and customers suggests it might be an important factor in people’s drinking. All of these are ideas that we may take forward in our lab studies. Pub staff also made valuable suggestions on how to improve future pub studies. One landlady said that we should do it over a whole week to get a better picture of the cadence of an average drinking week. On a personal level, I learned more as an experimenter helping with this study than in all my previous lab studies. Perhaps surprisingly, the attention to detail and organisation required is above the requirements of a lab study. The logistics involved are greater and an ability to think on your feet is essential. The real world is a challenging place to do research but the advantages are clear. The data collected reflects more natural behavior of participants and therefore your findings have greater relevance. Activity that would have otherwise have gone unnoticed can be observed. Qualitative data collected can inform future research. Another advantage is that you can interact with professionals who have their ear to the ground, which can lead to ideas for new studies. There are also some challenges. There is a greater probability that an external variable, not controlled for in your study, has influenced your findings. Natural environments lack the control of lab studies. It may be difficult to replicate a study when there are so many variables at play. Nevertheless, lab and naturalistic studies complement each other and there is a need for both in science. Advances in technology, such as tablet computers and smartphones, have made acquiring vast amounts of data in the ‘real world’ much easier. Researchers in TARG will continue to engage with the public in natural settings in the future and hopefully capture data that will inform people’s lifestyles and public health policy.